large transformed lymphocytes, probably B cell in origin, generally regarded as pathognomonic of Hodgkin disease; a typical cell has a pale-staining acidophilic cytoplasm and one or two large nuclei showing marginal clumping of chromatin and unusually conspicuous deeply acidophilic nucleoli; binucleate Reed-Sternberg cell frequently shows a mirror-image form (mirror-image cell). A large, abnormal, binucleated or multinucleated B cell that is characteristic of Hodgkin lymphoma. one of a number of large, abnormal, multinucleated reticuloendothelial cells in the lymphatic system found in Hodgkin's disease. 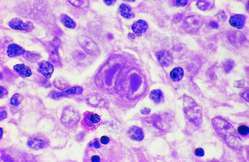 The number and proportion of Reed-Sternberg cells identified are the basis for the histopathological classification of Hodgkin's disease. Large transformed lymphocytes, probably B cell in origin, generally regarded as pathognomonic of Hodgkin lymphoma; a typical cell has a pale-staining acidophilic cytoplasm and one or two large nuclei showing marginal clumping of chromatin and unusually conspicuous deeply acidophilic nucleoli; binucleate Reed-Sternberg cells frequently show a mirror-image form (mirror-image cell). A giant, malignant, multinucleated B lymphocyte, the presence of which is the pathologic hallmark of Hodgkin's disease. 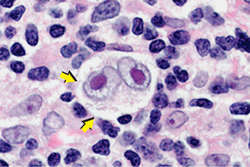 A giant cell with paired, mirror-image nuclei that is a diagnostic feature of HODGKIN'S LYMPHOMA and distinguishes it from non-Hodgkin's lymphoma. (Dorothy M. Reed, 1874–1964, American pathologist; and Karl von Sternberg, 1872–1935, Austrian pathologist).